This is a great cake - so easy and delicious without any unusual ingredients and no icing to worry about. A definite repeat. Also easy on the pocket. This cake is perfect, absolutely delicious and so easy to make. I used all of the syrup (added after baking). Note that you also need mixed spice and fresh ginger. This is the first time I've made Friands and they turned out perfectly. I used muffin tins and frozen egg whites I had stashed in the freezer. Cooking time was as per recipe. Didn't realise how easy they were. Fairly sweet (more like a cupcake?) but very tasty. Freezes well too. These are great muffins and I get about 16 muffins out of the mixture. Takes 20 minutes in my oven. I have made them several times and are great for lunchboxes. Highly recommend. These are a lovely savoury muffin and very popular at my house...they don't last long when freshly made and are a particularly yummy option to serve with soup. These are fantastic and utterly addictive. Have made these many times and always a hit, especially with coffee lovers when topped with the recommended icing. Made this to use up some of a large batch of lemon curd. Made the base in the food processor, adding the lemon curd and frozen raspberries and baked (for a little longer than recipe suggested timewise). Very simple. Keeps well in fridge and tastes great. These were absolutely demolished the day they were made and received rave reviews from the men in the house. Although there was nothing wrong with this recipe, the cookies came out flatter than I like. Not my favourite. These were delicious - great flavour and texture. Unfortunately these didn't work for me at all, very flat and flavour was a bit disappointing. Baking is David Herbert's passion. So when he decided to write a book about baking, he wanted to communicate some of the knowledge he has accumulated along the way, and to share treasured recipes. The result is an easy-to-use collection of delicious and reliable recipes that will both inspire novices and challenge seasoned bakers. 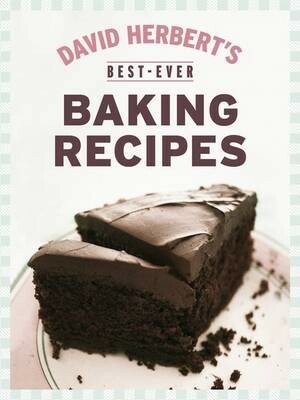 David Herbert's Best-Ever Baking Recipes gathers over 200 of David's favourite and most sought-after recipes for cakes, muffins, scones, biscuits, slices and tarts.